Through a partnership between Good Shepherd Food Bank, we opened the Lubec Community Food Pantry in January 2016. Our team of community volunteers work together on every second Wednesday of the month to unload the truck delivery and prepare for distribution and we distribute food every third Wednesday of the month from 1-4 pm. We also distribute emergency food upon request. From the beginning we discussed changing the pantry model from pre-packed boxes to a choice model. We currently serve over 178 families consisting of 384 individuals in our community and nine neighboring communities. Across our programs we have 110 volunteers that donate more than 1145 hours of their valuable time in any given year. The Lubec Pantry constitutes approximately 58% of our volunteer activity. 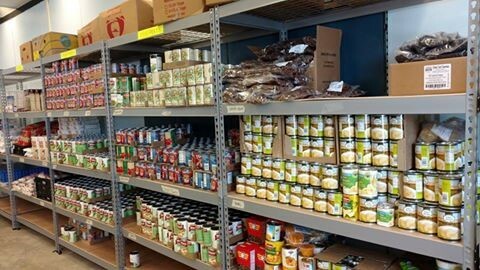 Our pantry operates solely on local donations. During 2016 as we worked on our strategic planning process organization wide we identified that philosophically we wanted to change to a choice model. We developed our pantry manual to support that change and prepared the space to be able to operate a choice model. Our major concerns related to the change were whether or not it would be more time consuming for our volunteers at distribution, tracking inventory, and whether or not we could control costs. The biggest challenge for us was no different than for any organization or person – fear of the unknown. Organizationally, we have accepted that change is not easy for any of us as human beings. We had a lot of discussion and planning with our volunteers and there was some skepticism and a willingness to try something new. We decided to see if it went well knowing we could always revert back to the former model. In February 2017 we completed our first choice distribution. The response was overwhelming from pantry participants. We had many comments from people thanking us for knowing that they could decide for themselves what they wanted to eat. This was very meaningful for us and a realization that we are very literally living our mission. The community food drive hosted by the post office every year typically brings food back to the pantry that was originally distributed by the pantry. During the last food drive we saw far less items being returned to us because people are now choosing food they will use. Six months after changing to a choice model we see that the work for volunteers has decreased by 22% and pantry expenses have decreased by 28% because we are no longer wasting food that people don’t want. The distribution time has been cut in half. Most importantly, the choice model helps restore a sense of pride for people struggling with the daily effects of living in poverty. Anything we can do that gives people hope breeds more hope and potential positive forward movement.